Candles and fall just seem to go together, so we made this Pumpkin Pie Candle Jar with all the coziness of fall in mind. We used a special crème wax that adheres well to glass, mixed red and yellow candle dye to make orange, and scented it with yummy pumpkin pie candle scent. We even made a fun label for it to turn it into a sweet hostess gift! We’ve included the steps below, if you’d like to make one! And you can download and print the label to make your candle gifty, too! We chose Crème Wax For Containers for this jar candle because of how well it sticks to the glass. 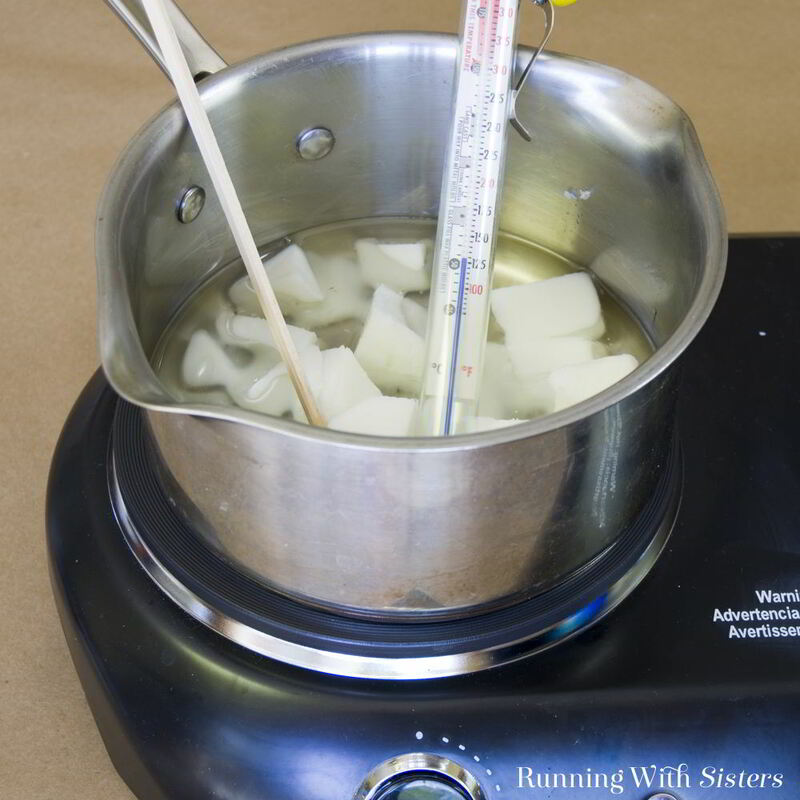 Other kinds of wax can pull away from the sides, leaving air pockets around the sides and making the candle look damaged. Attach the clip on the bottom of the wick to the inside bottom of the jar with a wick keeper (it’s like an adhesive foam dot). Be sure to center the wick in the jar! 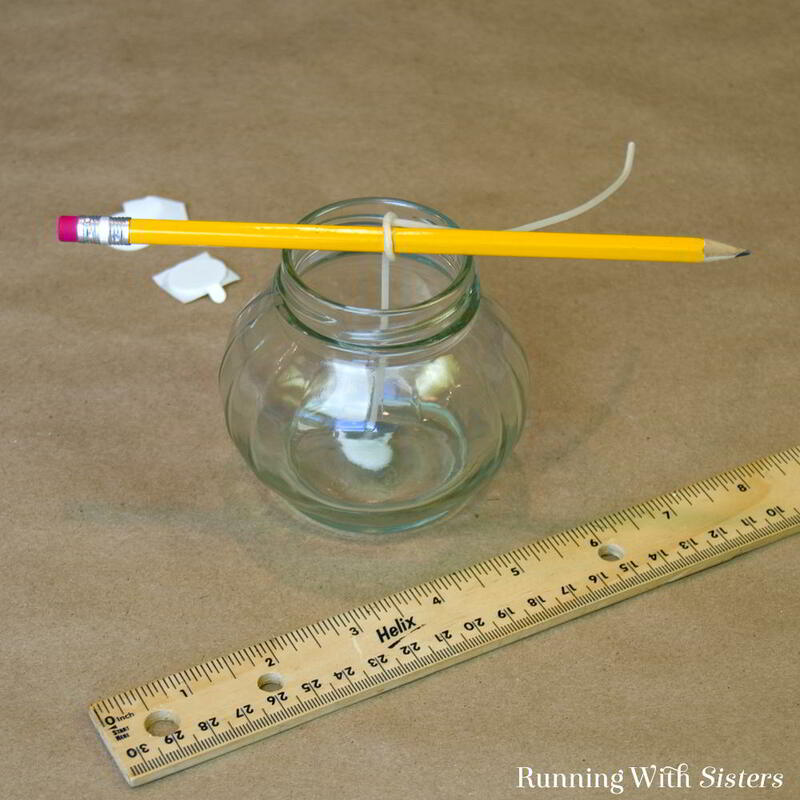 To keep the wick from sliding down inside the candle when you pour the melted wax in the jar, tie the other end of the wick up and around the pencil, and rest the pencil across the top. If you like our video, check out our YouTube Channel. We post new videos every week! 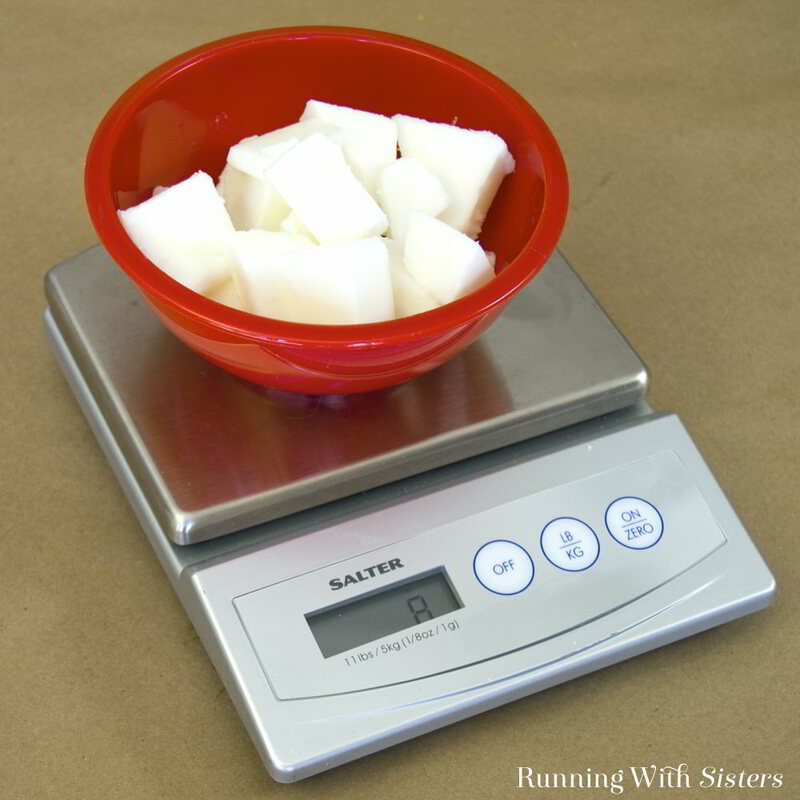 When the wax is melted and reaches 180 degrees F, shave off a few “carrot curls” from yellow dye block with the potato peeler. 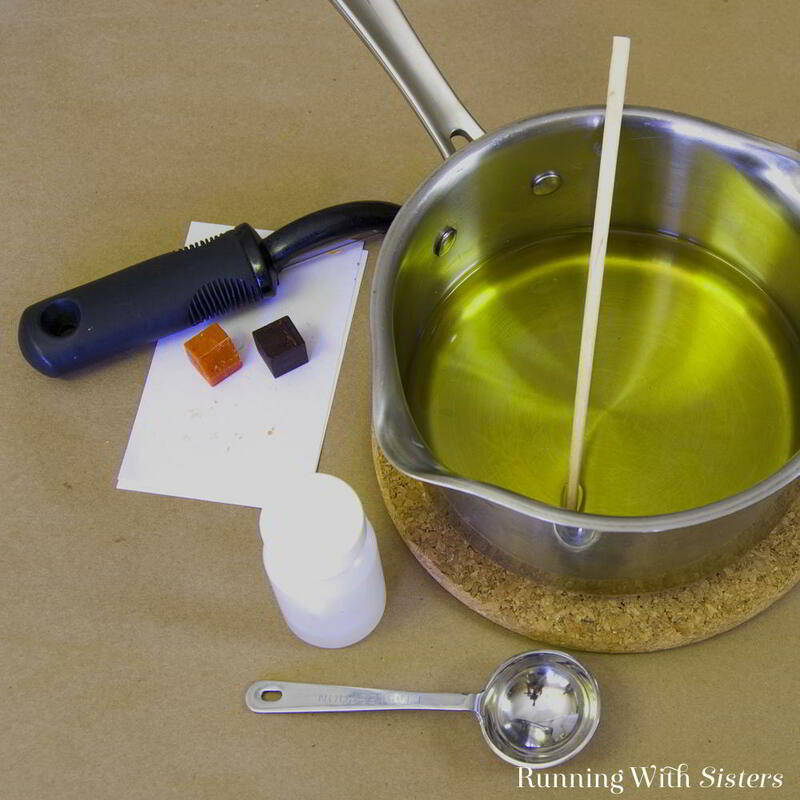 Mix it into the melted wax and with the chopstick. Add a few “carrot curls” off the red dye block to make orange. 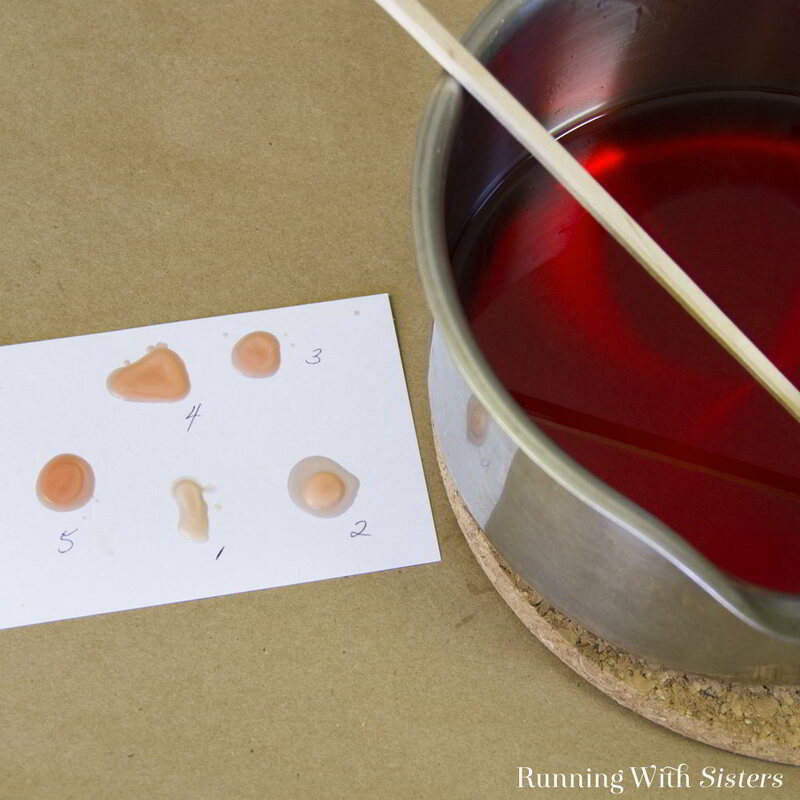 To see what the color will look like when it cools, drip the wax onto an index card and let it cool. If you like what you see, you can go ahead and add the scent, but add more candle dye if you think it needs more yellow or more red. 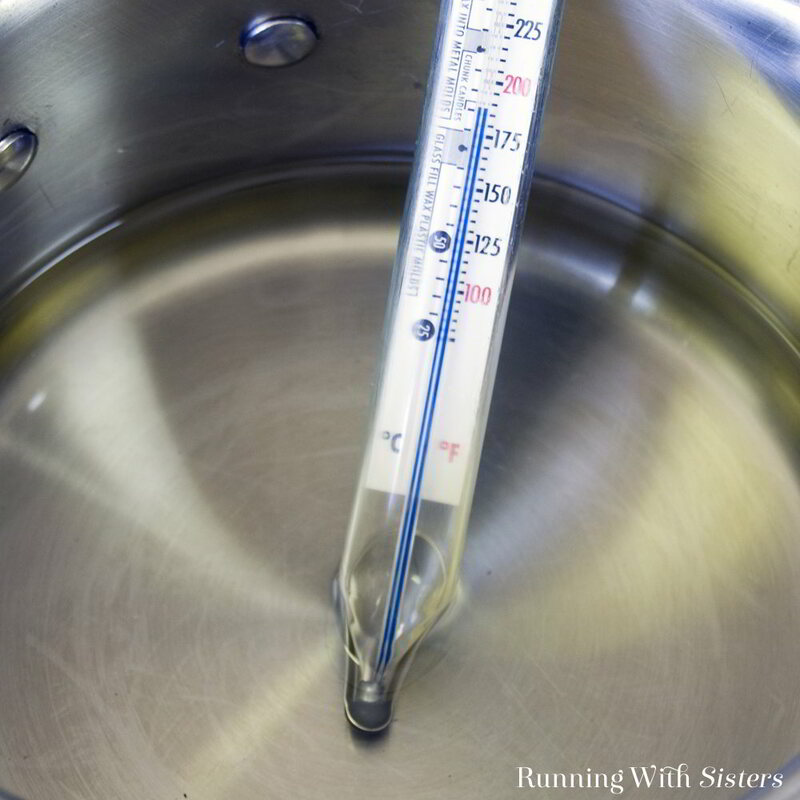 Let the wax cool to 175 degrees F, then stir in one tablespoon of Pumpkin Pie candle scent to the scented and dyed wax. Yum! 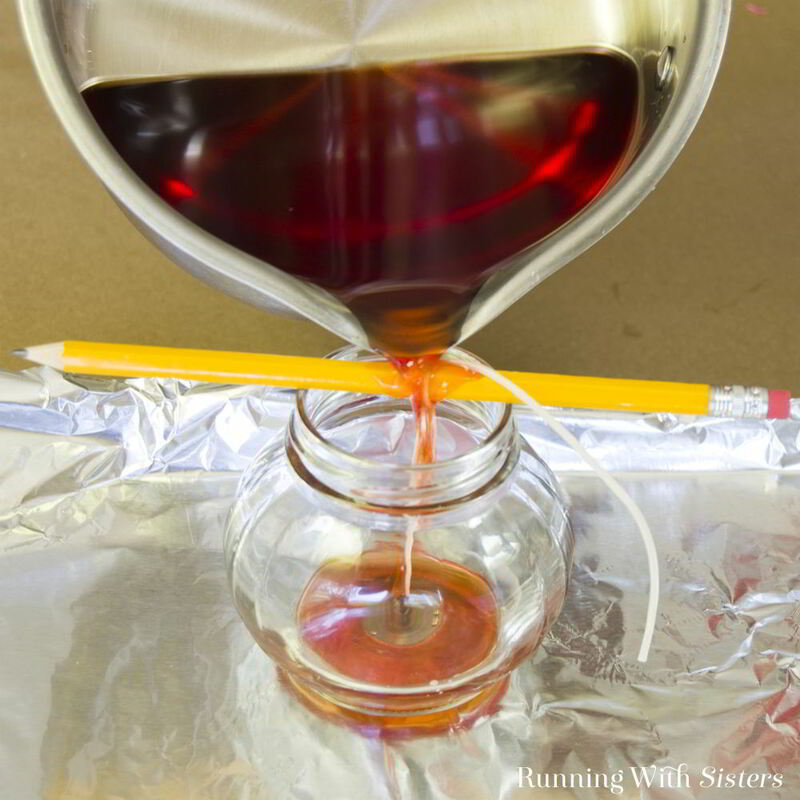 Pour the hot wax into the jar (be sure you wick the jar first!). We always pour wax over a protected surface, like a cookie sheet covered with foil. That makes clean up easy if you have any spills! Don’t worry about getting wax on the pencil, just be sure to center the wick when you’re done pouring. Recenter the wick. Then wait for one hour. Check on your candle to see if a divot has formed from the wax shrinking. If you see a divot, re-melt the remaining wax in the saucepan and pour into the candle divot. Be careful not to pour the wax up any higher than the original fill line. Let the candle cool for 24 hours on a level surface. 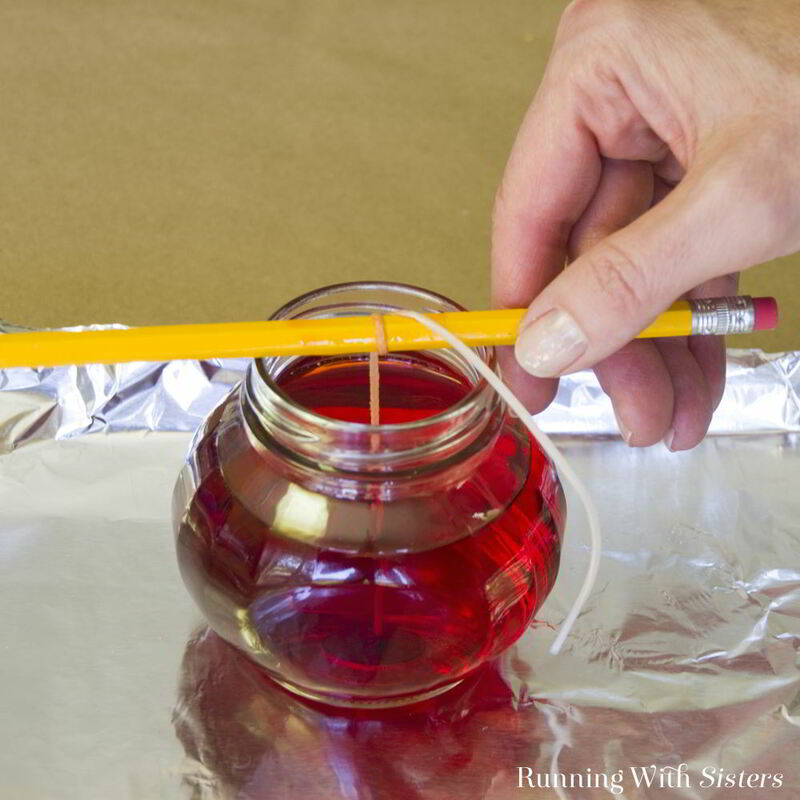 Pull out the pencil and trim the wick to 1/4 inch. Your Pumpkin Pie Candle Jar is ready to light up the night! 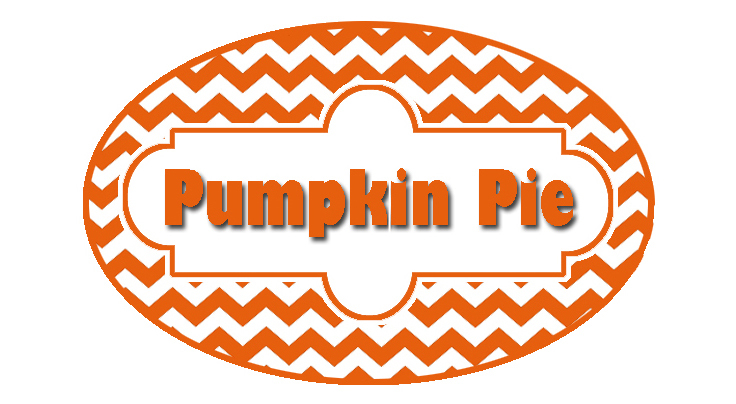 To add a label to your Pumpkin Pie Candle Jar, download the artwork here. Just right-click to download label. We think jar candles make terrific gifts! They already come in their own package. 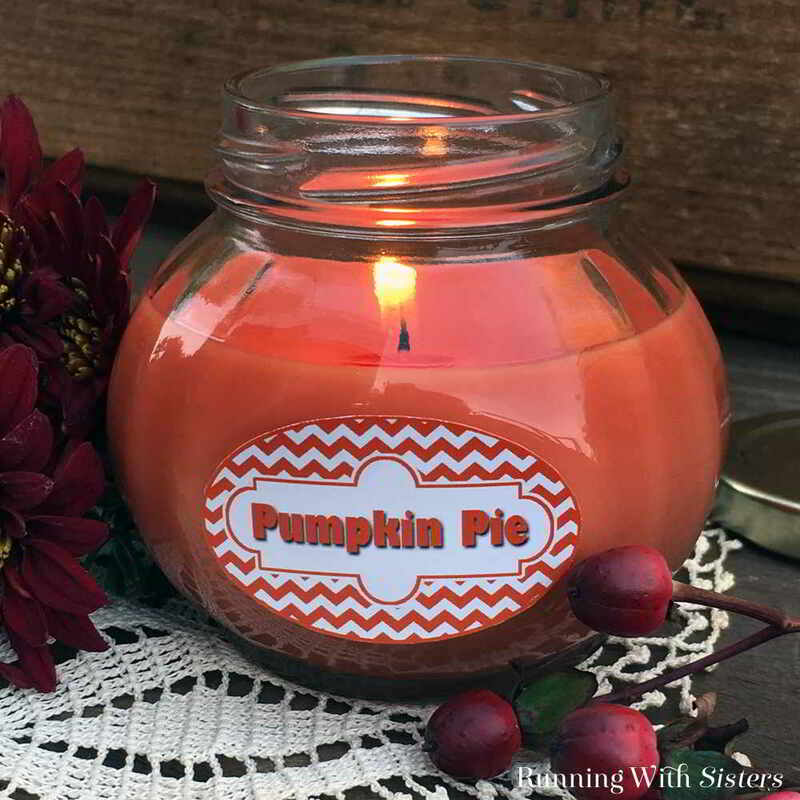 Remember while you’re working on your candle, if you have any questions while you’re making your own Pumpkin Pie Candle Jar, just leave us a comment below. We’re here to help! I’m making candles in tea cups, I hope! Do the cups need to be warm so the hot wax doesn’t crack or break them? I really don’t want to wear candle wax. Thanks. We also have a video lesson for Teacup Candles on Curious.com. If you have never been to Curious, it’s totally worth checking out. Tons of great craft lessons. Here’s a 20% off coupon in this link. http://tinyurl.com/CURIOUSTEACHER20 Plus you can watch some stuff for free. Thank you so much. I’ll be sure to check out the websites. I really enjoyed making the pumpkin pie candles my family and friends loved them and so did I. Wonderful to hear that, Annette! Aren’t they fun? We think they make such nice gifts. THANK YOU!! Your directions are the most complete I’ve ever read! 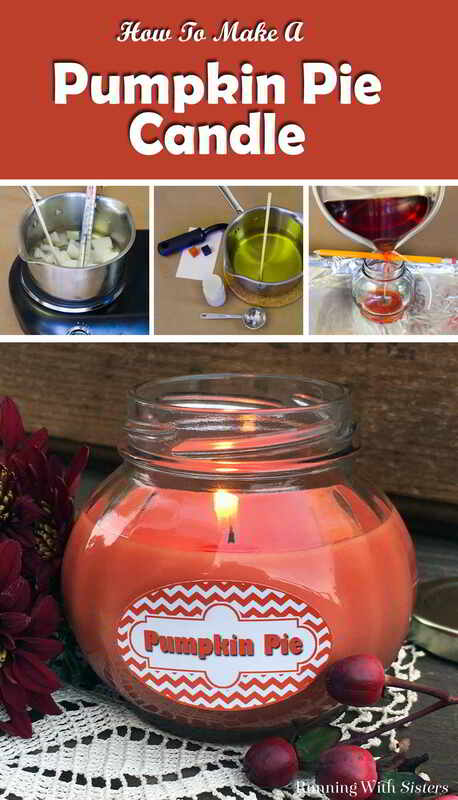 After reading this blog, I know I can make these beautiful candles, if I follow your directions. I had sooooo many questions when I started reading, and every single one was answered completely in easy to understand language. I would follow your blogs to the moon and back! I’m so impressed! Again, THANK YOU! !